Last week, Year 5 and 6 went to Beaumaris Beach to learn some of the lifesaving skills. On the first day of the lifesaving program we gathered all of our beach equipment and got ready to go to Beaumaris Beach. On the bus, we were so excited! Some of the skills we learnt in order to save an unconscious person were the D.R.S.A.B.C.D. Which is a type of first aid. The instructors informed us about this crucial procedure. Other skills we also learnt were, who to save first, just in case there are multiple people who are struggling to swim.There are 5 different people that are drowning. 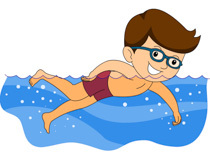 There is a weak swimmer, strong swimmer, unconscious person, injured swimmer and a non swimmer.The first person you should save is the non swimmer because they would have no experience in swimming. The next person you should save is the weak swimmer or the injured swimmer (depending on the injury). The fourth person you should save is the strong because in order to do D.R.S.A.B.C.D. on the unconscious person you have to make sure everybody else is safe before you can continue. On the 2nd day, we had ‘survival day’. We brought long pants and long tops. We put them on over other bathers. We swam far out into the water, we had to take off our ‘survival clothes’ and put them around our neck and swim back to shore. We also had to swim about 30m in our clothes and back. It was so much harder to swim because the clothes would weigh you down. For some of our warm ups, we played a few relays in the water. The instructor told us a few tips on how to move quicker and more efficient in the water. One of the tips was to wade.The other tip was to Dolphin Dive into the water and glide. These tips won’t waste as much energy and will make you swim faster. After, we used the Nipper Boards. The task was to do 20 strokes using the nipper boards then do a Eskimo role into the water. Another game we played was Flags. Flags is a fun game that anyone can play. Someone puts something in the sand, but makes sure there is one more player than objects. Then, everyone lies on the ground backwards and when the instructor says go, you turn around and try to get the object. The person without an object is out and it keeps going until there is one person left, who is the winner. We also learnt about Rips and Currents. The first thing we learnt is if you get stuck in a Rip, let it take you out then swim to the side then swim at least 20m to the side. Thank you to all the parent helpers for supporting us because without them we would not be able to do the lifesaving program.